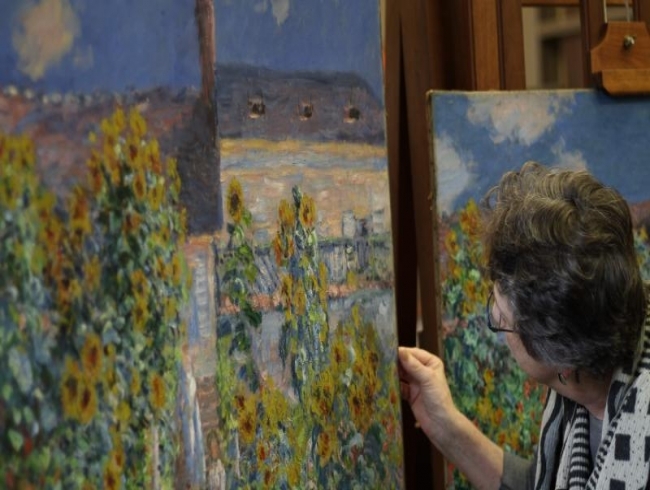 For the first time since they were painted more than a century ago, two oil paintings of Claude Monet's garden in Vetheuil have been reunited, in Washington. Monet moved to this village in the Paris suburbs in 1878 with his sickened wife Camille and their two young children as they faced financial difficulties, along with the family of one-time patron Ernest Hoschede. The period that ensued was one of the most prolific for the French Impressionist, who produced in just three years nearly 300 paintings, including "The Artist's Garden at Vetheuil" (1881). Until August 8, the National Gallery of Art is presenting two of four known works of this lush summer scene with huge sunflowers, including its own, larger piece and another temporarily on loan from California's Norton Simon Museum. "It's a turning point in terms of his career, his struggles, he's turning more toward landscape, he's becoming more interested in atmospheric effects," National Gallery curator of 19th century French paintings Kimberly Jones said in an interview. The Norton Simon's version, believed to have served as a model for its companion, is more heavily worked in most areas. "Before these two pictures were together, we always described the handling of this one as quite loose because we didn't have another example, and we had always believed ours was a study for the larger picture," said Norton Simon assistant curator Emily Talbot. "All of the things that have been published about these two pictures we're starting to question just by having them in the same space." Where Monet layered meridian green thickly on top of cobalt blue to give more interest to the sky in the Norton Simon's picture, in the companion piece it's defined instead by contrasts of thick and thin, and patches of exposed canvas ground. The National Gallery's senior conservator of paintings Ann Hoenigswald spent months removing a discolored natural resin varnish from the museum's masterpiece that had flattened the work visually. "The minute I got the varnish off, it just soared," she said. "What I find really exciting is the energy of the brushwork. You see the richness of the impasto and the speed at which he moves his brush across, and all the bristles of the brush, or a little lip of paint that just comes straggling there." It was not until almost 10 years later, in 1890, that Monet began painting formal series each comprised of dozens of works depicting a single subject -- the Rouen Cathedral, London's Houses of Parliament or water lilies -- at different seasons or times of the day usually from the same vantage point. The garden proto-series "could be the germ of an idea that's just starting to develop in his mind," said Jones.